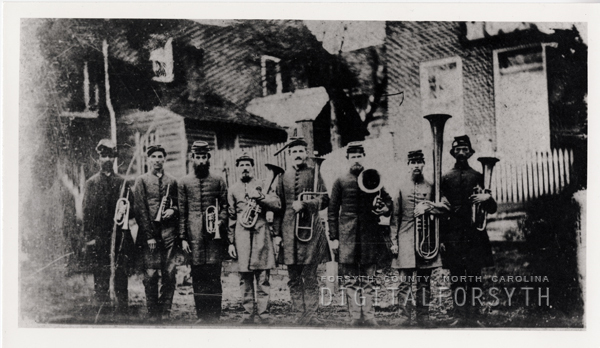 Members of the Salem Moravian Church Band joined the Confederacy and marched with the 26th North Carolina Regiment throughout the Civil War. The original photograph was taken in July or August 1862, while the soldiers were on furlough in Salem. Missing from this photo, apparently because he was ill, is the drummer, W.A. Reich. Later, as Gus Rich, he became famous throughout the South as a magician. Future NC governor Zeb Vance was a colonel in this regiment. While he was governor, the band serenaded him at his hotel in Salem. Thank you both for your excellent comments! These images are protected by copyright restrictions. Please contact the owning library (Old Salem Digtial Forsyth) for more information.